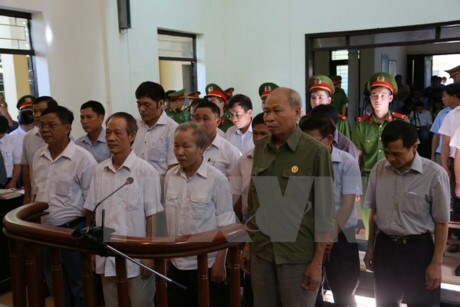 Hanoi (VNA) – The People’s Court of My Duc district, Hanoi, on August 8 opened the first instance trial on law violations regarding land management in the district’s Dong Tam commune. Among the defendants at the trial, 10 faced the charge of abusing position and power while on duty in pursuant to Article 281 of the Penal Code. They included three former Chairmen of the Dong Tam commune People’s Committee who are Nguyen Van Son, Le Dinh Thuan and Nguyen Van Bot. A former secretary of the commune’s Party Committee - Nguyen Tien Trien -, and a former commune official in charge of land registration - Nguyen Xuan Truong – are also among the group. Meanwhile, four others were charged with “irresponsibility causing serious consequences” in line with Article 285 of the Penal Code. They are Pham Huu Sach, former head of My Duc district’s Environment and Natural Resources Division; Dinh Van Dung, former Director of My Duc district’s Land Registration Office; Bach Van Dong, former Deputy Director of the district’s Land Registration Office; and Tran Trung Tan, an official of the district Land Registration Office. According to the indictment, between 2002 and 2013, Bot, Son, Thuan, and other key officials of Dong Tam commune illegally allocated and granted land to some local households, or legalized land that some households occupied illegally. Between 2011-2013, Dong Tam People’s Committee officials also helped with the legalization of applications for land-use certificates of 12 households for total area of 1,834 sq.m which were allocated or illegally occupied during 2002-2003. The trial will last two days.